On the morning of Sept. 13th, ICN TV network leaders came to ZCCA. ICN TV network has its branch channels in NY, San Francisco, Seattle, and Huston. The main audience for ICN TV network is American people. 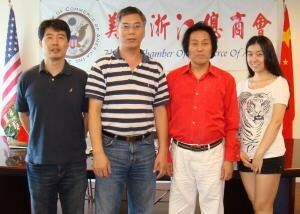 The ICN is an awesome platform to broadcast Chinese culture and news with great consideration of American people. As far as we know, Zhejiang merchants are well- known all over the world. Zhejiang merchants are a group of people who always knows how to raise money in China. The purpose for this cooperation between ICN TV network and American merchants is in respond of Zhejiang government policies. We hope we can increase the influence of our Zhejiang merchants, share success experience in commerce, and raise our brand image through this program.